Located along the Charlotte Avenue corridor in Nashville just east of Interstate 440 and south of I-40, 2700 Charlotte is only ½ mile from Nashville’s trendy West End neighborhood and Centennial Park. 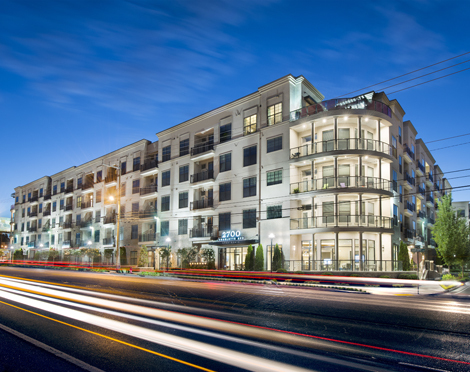 The 5-story luxury apartment building includes studio, one, and two bedroom ﬂoor plans. Apartment amenities include gourmet kitchens with stainless steel appliances and granite countertops, custom ﬂooring and cabinet options and oversized walk-in closets. The building is designed with wide, unconditioned corridors and the apartment units wrap both a 7-story precast concrete parking deck and an internal amenity courtyard with salt water pool, grilling areas and outside ﬁ replace. 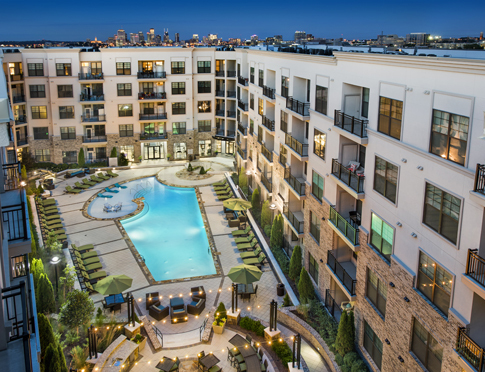 The community features a 5th Level amenity space leading to an open patio that has excellent views of downtown Nashville as viewed down Charlotte Avenue. The Clubroom and Fitness Center are located directly below on Level 1 and also lead to an open porch with views to downtown. RJTR provided master planning, architectural, interior design and FFE services for The Worthing Companies and Simpson Housing LLC.